This is My Father's World is a hymn written sometime in the 1800s by Maltbie Babcock, a preacher in upstate New York. It was published after his death in 1901, and set to music by Frank L. Sheppard. It references Psalm 104; Psalm 24; Acts 4:24; Acts 4. The text is a confession of faith and trust, a testimony that all creation around us is the handiwork of our Father, who made the creation (st. 1), charged us to take good care of it (st. 2), and continues to exercise his kingship over it ... The phrase "music of the spheres" in stanza 1 refers to the ancient belief that the planets made music or harmony as they revolved in the universe. Pythagoras, Plato, Kepler, Bohr, and Pastor Babcock all brushed up against the same order and harmony in creation in math, astronomy, and music, and each of these people throughout the centuries reacted to the divine knowledge of this creation differently, just as Romans 1 said they would. Some saw harmony and order in creation and worshiped it, while others saw harmony and order in creation and worshiped the Creator. 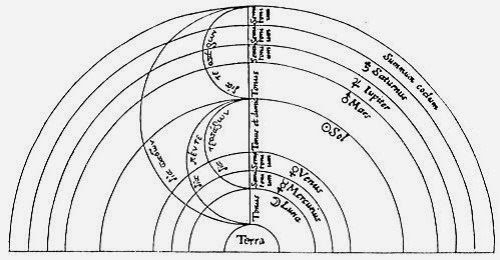 Musica Universalis is the Latin term for the Pythagorean philosophy called Music of the Spheres. Pythagoras initially developed the thought that the planets made music. This notion is not as far off as it sounds- Pythagoras was really on to string theory. Stay with me during this three part essay series as we look at the harmony of the order of the universe, math, and music. He was walking past a blacksmith's shop one day and heard the different tones of differently weighted hammers striking the anvils- in harmony. He heard the difference between discordant notes and harmonic notes, and realized after further exploration that there was an explanation- ratios. By some divine stroke of luck he happened to walk past the forge of a blacksmith and listened to the hammers pounding iron and producing a variegated harmony of reverberations between them, except for one combination of sounds." 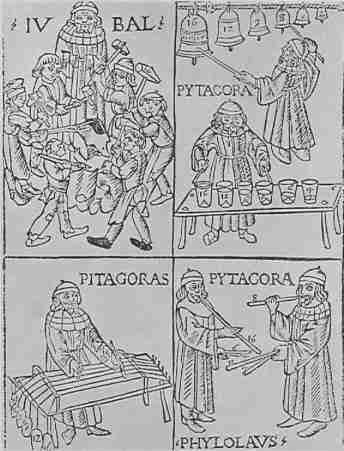 According to Iamblichus, [4th century scholar who wrote about the Pythagorean sect] Pythagoras immediately ran into the forge to investigate the harmony of the hammers. He noticed that most of the hammers could be struck simultaneously to generate a harmonious sound, whereas any combination containing one particular hammer always generated an unpleasant noise. Listen to Handel’s “Harmonious Blacksmith” from his fifth suite for harpsichord here.Whether the blacksmith story is legend or truth is hard to say- there is so little written about Pythagoras himself, though lots about the sect he founded. Already steeped in music for pleasure, Pythagoras was an excellent lyre player and after the blacksmith incident he began to notice ratios in stringed instruments also. Pythagoras knew what much of previous antiquity had long understood but had not known why: audible tones based on low-number relationships produce harmonious sounds that are easy on the ear and soothe the soul. Apparently at some point, blacksmith incident or not, the penny dropped for Pythagoras and he discovered octaves. Early musicians had little to no understanding of why particular notes were harmonious and had no objective system for tuning their instruments. Instead they tuned their lyres purely by ear until a harmony emerged-- i.e., until it sounded good. Pythagoras used to say they were torturing the pegs. Yet Pythagoras thought intuitively that music held deeper properties. The hidden ratios were one such deeper property, and its soothing effect was another. He said the vibrations of the music went “to the brain and the blood and transmitted to the soul." (quote from Nichomachus, a Pythagorean who wrote the "Manual of Harmonics."). Pythagoras believed that music's harmony on earth, in the universe, and through the body was so unified and so pervasive that the soul could be calmed by certain compositions. If Pythagoras had just read the bible, he would know this to be true. In 2 Kings 3:15 it is written, "But now bring me a minstrel." Pulpit Commentary says, "A player on the harp seems to be intended. Music was cultivated in the schools of the prophets (1 Samuel 10:5; 1 Chronicles 25:1-3), and was employed to soothe and quiet the soul, to help it to forget things earthly and external, and bring it into that ecstatic condition in which it was most open to the reception of Divine influences." So, music was the precursor to prayer and petition and thanks and praise! Music was used as a vehicle to alter a physical, emotional, and biological state; and to prepare the heart and mind for close communion with God. Pythagoras however missed the point of music, which was to praise God and not to self-actualize by engaging in works that raise our vibrations so as to meld with the Good. There is geometry in the humming of the strings, there is music in the spacing of the spheres. ~Pythagoras.While musical spacing is a terrific advance in music theory, using music to calm a soul devoid of Holy Spirit is a pointless endeavor. Pythagoras came so close in understanding the divine nature of music but veered so far away from it when suppressing the truth about God in pursuit of mystical musical meanings. He applied music to healing and health rather than praise and petition. To that end, Pythagoras claimed to have cured various ailments of the the spirit, soul, and body by having specifically composed musical selections played for the one who needed curing. In this way, Pythagoras replicated without understanding the fact of music's effect upon the soul, as 1 Samuel below shows. He had invented a sacred music, but not the sacred music based on the God of the bible, as the Psalms are. Gill said, "so Saul was refreshed, and was well; became cheerful, his grief was removed, his black and gloomy apprehensions of things were dispersed, and he was cured of his melancholy disorder for the present..."
In the Pythagorean concept of the music of the spheres, the interval between the earth and the sphere of the fixed stars was considered to be a diapason--the most perfect harmonic interval. ~From Stanley's The History of Philosophy. Pythagoras thought that the celestial bodies vibrated too, that the heavens themselves made a harmonious music in their orderly progressions around orbits. In effect, Pythagoras thought that "everything vibrates," which isn't far off the mark given what we now know about electromagnetic vibrations and waves. Unfortunately, in none of these philosophies connected to Pythagoras did the Pythagoreans in the main connect to the One True God, who created that order and harmony. They went Hermetic, they went Gnostic, they went Rosicrucian. They went every which way except Christian. More on that in part 3. In the second part let's look at Pythagoras's notion of string theory, from his time in 500BC to Kepler in the 1600s, to Niels Bohr and the modern quantum physics of the early 20th century. In part 3 I'll take a look at how close but how far Pythagoras came to the truth, and how easy it is for satan to divert us when our soul intuitively responds to God in creation. I'll finish part 3 with Preacher Babcock and My Father's World.